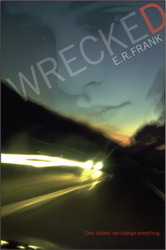 Plot: Wrecked is about a girl in high school named Anna who gets into a serious car accident with her best friend Ellen after a night of partying. To make matters worse, the driver of the second car that was involved in the accident is the girlfriend of Anna’s brother, Cameron, who dies shortly after the collision. This story takes you through the night of the accident and the aftermath that changed not just the lives of Anna, Ellen, and Cameron, but their families and friends. The reader follows this story through the eyes of Anna and the guilt that she carries with her due to an incident that may or may not have been her fault. A traumatic and bittersweet story of loss and healing, and learning about what to do next. Opinion: I read this book a few years ago and decided to re-read it and give it a review. For it’s simplistic storyline and very straight forward description, this is actually a great read. It is a Young Adult book about a girl named Anna who goes to a party with her best friend, Ellen, and drinks for the first time. After a couple shots and about three hours later, Anna realizes she missed curfew and drives herself and Ellen home. On the way, Anna and Ellen get into a serious car accident. All Anna can remember is a U2 song playing the same lyrics over and over, a terrible smacking sound, and her best friend Ellen laying in her lap, bloody. She keeps hearing screaming, not knowing who it is, and then eventually passes out. After she wakes up, she learns that Ellen is in the intensive care unit with a collapsed lung, a broken leg, and multiple broken ribs. She also learns that there was another car involved in the accident, and that the driver was her brother Jack’s girlfriend, Cameron..who ended up dying shortly after impact. We have all read news articles and heard stories about someone that was drinking, getting into a car accident and killing another car full of people, and then walking away unharmed. Anna has some blood in her eye afterwards and has to wear an eye protector, but walks away with hardly any physical damage. Which of course doesn’t help the guilt that she is feeling after almost killing her best friend and ACTUALLY killing her brother’s girlfriend. This story takes you through Anna dealing with the emotional pain and blaming herself for everything that happened, while all the while trying to ensure that her brother can forgive her. There are two things about this story that bother me: FIRST, Anna drank a few shots before she drove and her father told her in the hospital that her blood alcohol content was under the legal limit. Later in the story you learn that there will be no lawsuits because it was purely an accident, but I mean COME ON! No underage person who has alcohol in their system and gets into a SERIOUS car accident is going to not get some kind of punishment. Where is her DUI? Why was nothing mentioned about her being underage and drinking? That’s great that she was under the legal limit, but she wasn’t even legal to be drinking in the first place! I wish the author would have at least mentioned something on the matter instead of just passing it by. The SECOND thing that bothered me was the way everyone acted towards Anna afterwards. You would think that there would be people that were angry with Anna for what happened, though it was an accident. But people deal with loss in different ways, so I am just a little surprised she didn’t get told off by at least one person. Her brother Jack deals with his pain of what happened by being short with Anna and refusing to talk about Cameron for a long time, which is completely understandable, but that is about as mean as anybody gets about it. The author had an amazing way of writing the story and tying in different things that would let you get to know Anna and her family dynamics more. Anna would be conversing with a family member or friend and something would trigger a memory for her. So the story would skip over to the memory, and then go back to the conversation. I absolutely LOVED this! It helps the reader feel like they know the characters more, and it is something that happens to everyone so it made the story much more…human? Yeah, let’s go with human. Another part of the story I enjoyed was Anna’s love interest Seth, and her keeping him at arms length while she figures things out. I am SO glad that the author didn’t make this all about a love story and forget about the real issue at hand. Overall, the story is really fantastic. I would say it is for a younger audience, but I think everyone can relate to the story in one way or another. I have always wondered what it must be like for someone who goes through an experience like that, and this story definitely sheds some light on the sadness and guilt one can feel. This book makes you feel sad and guilty, but also comforted in the end. I definitely recommend this book if you are looking for something that doesn’t have an overwhelming love story and will make you think twice about the decisions you make.